I have been a member of the CSG community my entire life. I attended CSG in preschool and then again from seventh grade through graduation. After that, with the exception of college, I never left, enjoying a decades' long career as a teacher and administrator in the Lower School. I even was a parent, sending my daughter, Amy Bodiker Baskes '90, to CSG from preschool through high school. One of many lessons that CSG taught to me is the importance of sharing our own gifts with our community – in all the ways we could participate. In fact, even as a student, I became a member of the Philanthropic Club, making decorations to brighten the meal trays for patients at Children's Hospital and collecting money with the faculty for the United Way. And I continue to give back to my community. Working weekly in a food pantry just down the road from the school is only my most recent endeavor. Having been both a student and a teacher, both a beneficiary and a provider of a CSG education, I enjoy a unique perspective of the positive impacts that CSG has on young girls. My long-time connection with the school has also enabled me to observe many generations of CSG students graduate. I especially relished observing the growing social confidence and academic performance of all our students. Making our school run successfully and purposefully depends on the generosity of our donors. For all of these reasons, CSG is one of my top philanthropic priorities. Supporting CSG has been a priority for my classmates, too. Like me, many of them sent their daughters and granddaughters to the school. 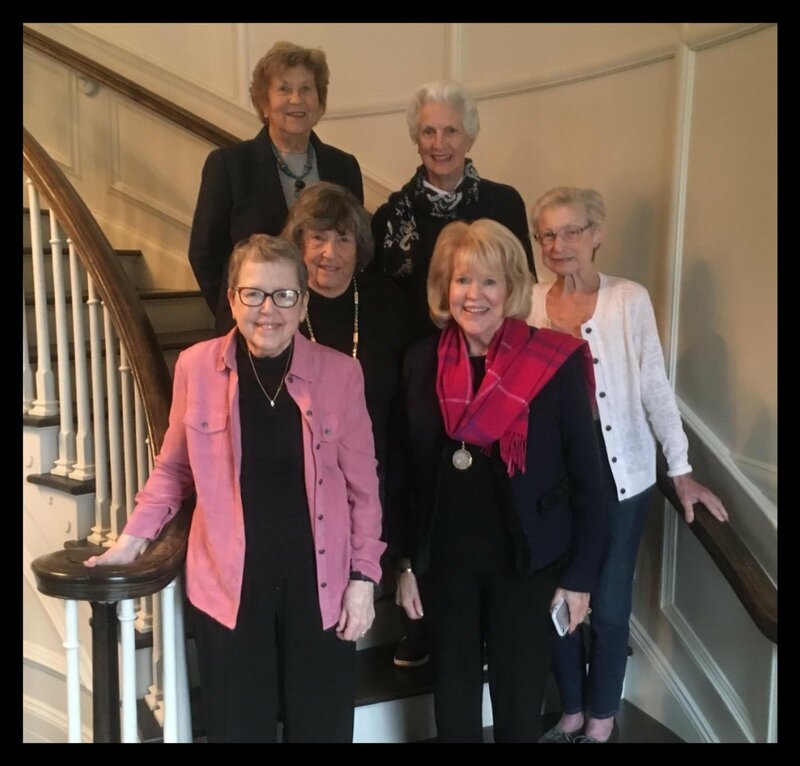 Many of us have served the school in volunteer roles on the Parent Association, the Alumnae Board, or the Board of Trustees. Building on Joe Jeffrey's donation of part of his property to the school's Centennial Campaign in memory of his late wife, Cynthia Black Jeffrey, our class president and beloved friend, the focus of our more recent support has been to help make Cynthia's Woods be the best outdoor learning environment it can be. Our contributions along with those of our friends from the Class of 1955 have helped to construct a formal classroom on the property. A true Red-Gold effort! As my classmates and I prepare for our 65th reunion next spring, we reflect on our years of friendship with gratitude. We also look back with appreciation on the excellent all-girl education and experience that CSG provides. In this season of giving, I invite you to consider the many gifts CSG has given you and to make a gift in support of the school's continued impact on generations to come. The photo above pictures Connie and her fellow 1954 classmates this November preparing for their 65th reunion weekend. The holiday season is upon us! Alumnae Board members thoroughly enjoyed ourselves at the Thanksgiving Program and the Alumnae Swim and Diving Meet last month. We loved seeing the PYC girls usher in this season of family and gratitude with their familiar musical selections and their joy. Many of us had to work hard to conceal tears while looking at those cute faces! As 2019 approaches, the new year serves as a reminder that Alumnae Weekend is not too far away! 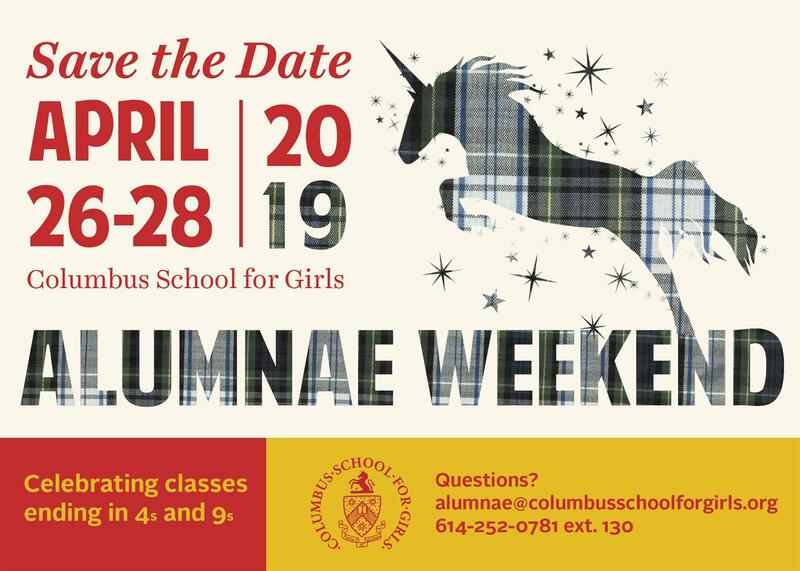 Alumnae Weekend 2019 will highlight milestone reunion years for ladies who graduated in years ending in 4 and 9, but we encourage all alumnae to joins us for a weekend of connecting and community. We are adding a few new events, bringing back a couple of traditions, and allowing plenty of time to network, catch up, and laugh. The Alumnae Board is working hard to put the finishing touches on a great weekend. Please reach out to us with any questions. We can't wait to see you there! Finally, as Connie notes above, alumnae participation is vital to the CSG Annual Fund. The Annual Fund plays a crucial role in ensuring that CSG can provide an exceptional experience to its current students - the leaders of tomorrow. Click here to make your gift online or give CSG a call: 614.252.0781 ext. 130. Questions about your Annual Fund gift? Send us an email: alumnae@columbusschoolforgirls.org. We want to hear from you! Please submit important personal or class news to alumnae@columbusschoolforgirls.org! By sharing updates, we can ensure that our alumnae community celebrates and supports you and your classmates.